The classic ichthyosaur Ichthyosaurus communis, from here. 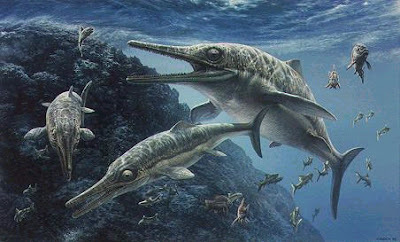 Ichthyosaurs have long been one of the most famous examples of convergent evolution. These Mesozoic marine reptiles, as any textbook will tell you, evolved a body form similar to that of modern dolphins and sharks, and presumably held a similar niche as fast-swimming apex predators. But interesting as that might be, it's certainly not all there is to be said about ichthyosaurs. The classic ichthyosaurs that said textbooks will usually depict are members of the clade Thunnosauria that first appeared in the upper Triassic (Thorne et al. 2011). Thunnosaurs differ from other ichthyosaurs in having a relatively short tail, shorter than the trunk, and hindfins that are much shorter than (usually less than half as long as) the forefins (Maisch & Matzke 2000). The name 'Thunnosauria' appropriately means 'tuna-lizards': as with modern tunas, the compact body of the thunnosaurs indicates greater specialisation for more powerful, tail-driven swimming. Cast of the short-beaked Ichthyosaurus breviceps, from Charmouth Heritage Coast Centre. In the Lower Jurassic, thunnosaurs are represented by the genera Ichthyosaurus and Stenopterygius, though the known fossil record for the former is earlier than that of the latter. Both genera are represented by hundreds (if not thousands in the case of Stenopterygius) of known specimens from Europe (Motani 2005): primarily England for Ichthyosaurus, Germany for Stenopterygius. Stenopterygius grew up to 4 m in length; Ichthyosaurus would have been somewhat smaller (Maisch & Matzke 2000). One species of Ichthyosaurus, I. breviceps, stands out for its particularly short and robust rostrum in comparison to other species. Another potential Lower Jurassic thunnosaur is Hauffiopteryx typicus, which also has a distinctively small rostrum, but in this case a particularly fine and slender one (Maisch 2008). Mounted skeleton of Ophthalmosaurus icenicus, from the British Natural History Museum. During the Lower Jurassic, the thunnosaurs were among a number of ichthyosaur lineages present. By the time of the Upper Jurassic, all surviving ichthyosaurs (with one possible exception*) belonged to a single thunnosaur lineage, the Ophthalmosauridae. Unfortunately, for most of the Middle Jurassic the ichthyosaur fossil record is missing, and a gap of more than ten million years separates Stenopterygius from Ophthalmosaurus. The only break in this gap is the Argentinan Chacaicosaurus cayi, which sits a few million years later than Stenopterygius. Intriguingly, Chacaicosaurus is not only intermediate in age, it is intermediate in morphology: while its skull is similar to that of Ophthalmosaurus, its forefin is more similar to that of Stenopterygius. As noted by Maisch & Matzke (2000), "It appears as if Chacaicosaurus cayi is one of the rare forms that are true structural intermediates". *The possible exception is the Upper Jurassic Nannopterygius enthekiodon, some features of which suggest that it occupies a more basal Stenopterygius-grade position (Maisch & Matzke 2000). Unfortunately, it has not yet been adequately described and included in a formal phylogenetic analysis. This is rather frustrating: Nannopterygius promises to be a quite distinctive animal, with greatly reduced fins and long spinal processes on the anterior tail vertebrate. Reconstruction of Platypterygius bannovkensis, by Olorotitan. 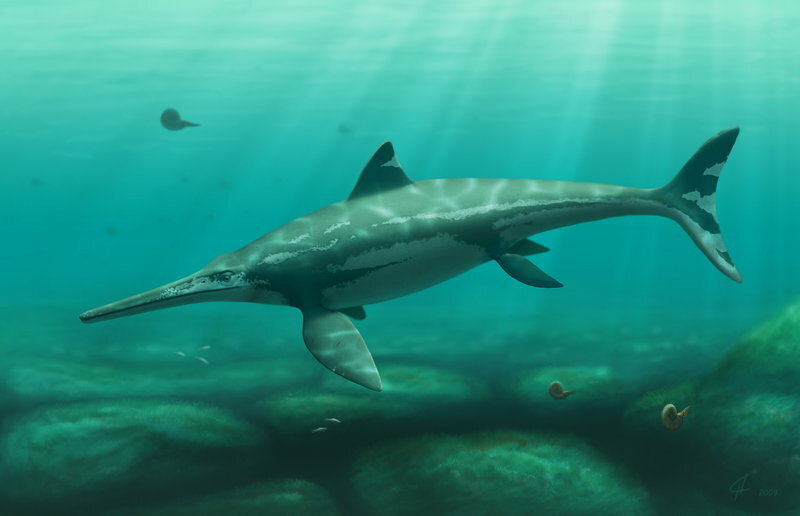 Platypterygius was the latest surviving ichthyosaur genus. The ophthalmosaurids survived from the late Middle Jurassic to the early Upper Cretaceous. Ophthalmosaurus had a slender rostrum with reduced dentition, while other genera such as Brachypterygius and Platypterygius had higher, more robust rostra with their full complement of teeth. Some ophthalmosaurids grew very large: Platypterygius reached up to 9 m. The name Ophthalmosaurus means 'eye lizard', and reference to the large eyes of this ichthyosaur seems to be de rigeur for any popular book in which it features, together with some speculation that it may have been a nocturnal hunter. However, a quick scan through the various ichthyosaur skulls illustrated by Maisch and Matzke (2000) indicates that ichthyosaur eyes were generally large. Those of Ophthalmosaurus were not the largest; the eyes of Eurhinosaurus longirostris are particularly ridiculous, with orbits filling almost the entire side of the cranium! So perhaps the question should not be why Ophthalmosaurus had large eyes, but why those ichthyosaurs without large eyes had reduced them. Maisch, M. W. 2008. Revision der Gattung Stenopterygius Jaekel, 1904 emend. von Huene, 1922 (Reptilia: Ichthyosauria) aus dem unteren Jura Westeuropas. Palaeodiversity 1: 227-271. Maisch, M. W., & A. T. Matzke. 2000. The Ichthyosauria. Stuttgarter Beiträge zur Naturkunde Serie B (Geologie und Paläontologie) 298: 1-159. Motani, R. 2005. True skull roof configuration of Ichthyosaurus and Stenopterygius and its implications. Journal of Vertebrate Paleontology 25 (2): 338-342. Thorne, P. M., M. Ruta & M. J. Benton. 2011. Resetting the evolution of marine reptiles at the Triassic-Jurassic boundary. 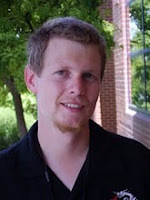 Proceedings of the National Academy of Sciences of the USA 108 (20): 8339-8344. Also worth noting that despite a century's worth of pondering, we still haven't got the foggiest idea about the origins of the Icthyosaurs - as a very detailed and lengthy recent review states: "In the case of the ichthyosaurs we know that they are amniotes, and that they are not synapsids". 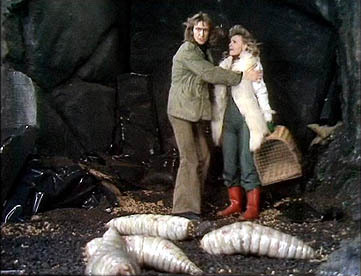 And that's about all that we can deduce until a miracle fossil turns up! Pop-quiz: who coined the term "Thunnosaur?" And I don't mean who first published the name, but who actually invented it? I know! And don't forget poor little Mollesaurus the other Middle Jurassic ichthyosaur from Argentina. Intriguingly, there is something of a gap in the Plesiosaur fossil record across this same interval with only Simolestes and Maresaurus bridging rich faunas know from the Toarcian and the Callovian. But marine crocodiles are rather more abundant (though still more scarce than through much of the rest of the Jurassic). I must admit, I had thought that Mollesaurus was one of the Late Jurassic taxa. So the gap in the ichthyosaur fossil record doesn't simply reflect a gap in the marine fossil record in general? There was an ocean anoxic event in the Toarcian and if you look at various marine invert diversity compilations most show a slight dip in the Aalenian during a time of marine regression in Europe and probably global cooling. But that bounces back quickly in the Bajocian and Bathonian. Outcrop area and rock volume estimates for Europe and North America mostly show the same thing. Much less obvious evidence for geologic bias than say across the J-K boundary where there is a comparable gap in the marine reptile record. I suspect there is something "real" going on w.r.t. environmental change and reduced diversity among the more pelagic groups -- but it's curious that marine crocodiles are seemingly less affected I would expect them to be MORE sensitive to fluctuations in sea level or global temperature. Then again, maybe it's just an idiosyncrasy in the record.